Tantalise your taste-buds and enjoy the flavours of a freshly baked lemon sponge cake straight from the oven. Lemon Tart by Mr Wicks is a zesty tongue tingling lemon tart. 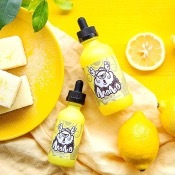 MoMo E-Liquid has added a new product to their already breathtaking line of liquids "Lime-Berry" featuring the finest and sweetest Italian lime sorbet with lashings of citrus tang.